The greenhouses are in all their glory during the holiday season, and we love to show it off! Poinsettias and many other gift plants, Christmas trees, hand-decorated natural wreaths with hand-tied bows, are still on sale. Visitors enjoyed wine from Jorge Ordonez Selections, music by the jazz players BadSlax, and Hors d'oeuvres, as well as raffle prizes, which benefitted the G.R.O.W.E.R.S. vocational horticulture program for adults with developmental disabilities. Friday, Dec. 4, Saturday, Dec. 5, Sunday, Dec. 6. At the wreath making workshop, families chose from the G.R.O.W.E.R.S. selection of wreath decorating supplies and hand tied ribbons and create their own wreaths. Proceeds benefit the G.R.O.W.E.R.S. program. Note: G.R.O.W.E.R.S., Inc. provides horticultural education, employment opportunities, and therapy for adults with developmental and physical disabilities. "Private to Public: Great Estates and the Creation of Parks." Close to 50 people enjoyed the event. These days, many citizens and planners worry about the rampant privatization of public space in cities around the world. Their concerns are well-founded, but should be set in the context of almost two centuries of creating significant public parks and other spaces, including nature preserves, through outright donation of, or other forms of making available, private estates. From the Royal Parks of London, to the U.S. National Park system, this unique form of public-spirited philanthropy has given us some of our most prized public spaces, such as Edgerton Park itself. Learn more about Alan Plattus. Click here. For a printable list – of all the 50th Anniversary events, ﻿click here. SUNDAY IN THE PARK • SUNDAY, SEPTEMBER 20 • 11 a.m. – 5 p.m.
Sunday in the Park.Sunday in the Park.\This was the 27th annual family fair in Edgerton Park. No admission fee, but the proceeds from the games, rides and sales all go toward park restoration. Click for details. It's time to renew your membership. Click here. please donate online via PayPal. EDGERTON PARK IS A JEWEL. HELP US PRESERVE IT! Some areas of our beloved Edgerton Park, like much of Connecticut, have become home to an ever-growing population of invasive plants. Norway maple, bittersweet, multi-flora rose, burning bush, and ailanthus are thriving in our woodland environment. Quoting from the CT Invasive Plant Working Group: "In minimally-managed areas, invasive plants crowd out native plants. The presence of invasive plants alters the way plants, animals, soil, and water interact within native ecosystems, often causing harm to other species in addition to the plants that have been crowded out." The Edgerton Park Conservancy Board understands that the best way to control invasives is to remove them before the infestation worsens. Since January, we have been doing invasive removal around the wooded area to the east of the fountain, near the bridge. Replanting is following the original park plan. With responsible forestry, our woodland areas will be healthier. This annual event (the 27th!) was held on Sept. 21. And lots more plus, of course, the park's magnificent beauty. It has indeed been a busy year at the park. The building pictured below is shown before and after renovation. It is located behind the Carriage House and was the Brewster family's garage (see History) and, until recently, the stable for the New Haven Police Department's mounted patrol. This year the exterior of that building was sealed, new garage doors installed and other repairs made before the building was painted. 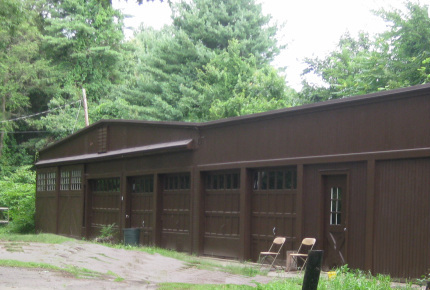 The building is used to store gardening tools and equipment for maintaining the grounds and to store props for the annual Sunday in the Park. The upgrades make it possible to use the building for additional park activities. The barn before renovation. She the After photo below. The website Historic Barns of Connecticut devotes a page to Edgerton Park, noting its significant as a well-preserved example of an important trend in landscape architecture - the Country Place Era. Click to read more. Edgerton Park once again hosted the annual CONNECTICUT TREE CLIMBING COMPETITION. On Sat., May 3 the all-day event ran from 7 a.m. to 4 p.m.
Events Included: Secured Foot Lock, Throw line Accuracy, Belayed Speed Climb, Work Climb Station, Aerial Rescue, and Master's Challenge. Participants had to be in good physical shape and have tree care skills needed for this all-day event. On March 29 a total of nine trees were planted by New Haven high school students from the Sound School and Common Ground School under the direction of Yale's Urban Resource Initiative (URI). Edgerton park Board members report that the high school students did well and worked hard! • The stone retaining wall adjacent to the greenhouses was repointed. Currently, the Board is making plans to enlarge the library in the Carriage house by connecting the library with the space formerly used by officers of the New Haven Police Department. 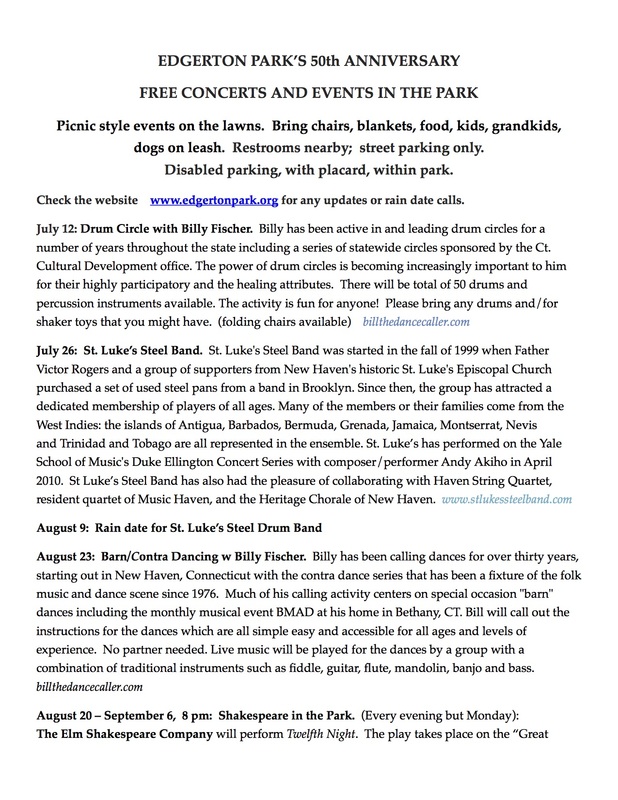 The Park was the feature of the Dec. 5, 2013 "Daily Nutmeg", a New Haven area on-line news journal. The title is "Public Utility." If you missed the feature, click here to read. Edgerton Greenhouses and other facilities are located just off Whitney Avenue at 75 Cliff Street at the Hamden-New Haven line. There is also an entrance from Edgehill Road.